Does Mission Impossible IV: Ghost Protocol, return Cruise to Top Gun status, or do further damage to his once legendary reputation? Click on the jump to find out! For those of you who remember Tom Cruise before "The Couch," before the strange marriage to Katie Holmes and his weird fascination with Scientology, you are lucky. From Risky Business and Top Gun, to A Few Good Men and Jerry Maguire,Cruise owned the movies. Then came that interview with Oprah, and that plus a string of flops (Minority Report, Collateral) sent audiences running. Mission Impossible III, now 6 years in the mirror, failed to draw audiences, and even the very good Valkyrie failed to attract much attention. Any actor would love that sort of filmography attached to their name, but the mystique Cruise created for himself has understandably kept audiences away. So, does Cruise he redeem himself with MI:IV? The answer is an enthusiastic yes. MI:IV is a terrific film, complete with amazing stunts, great character development, fresh faces, and the always necessary cameos, with one that supposedly never materialized (read further for more). Cruise once again performs his own stunts, and he has the face to prove it; his age is starting to show, but it's given him the "I just got out of a bar fight" look, ala Daniel Craig in the Bond movies, and I'm ok with that. 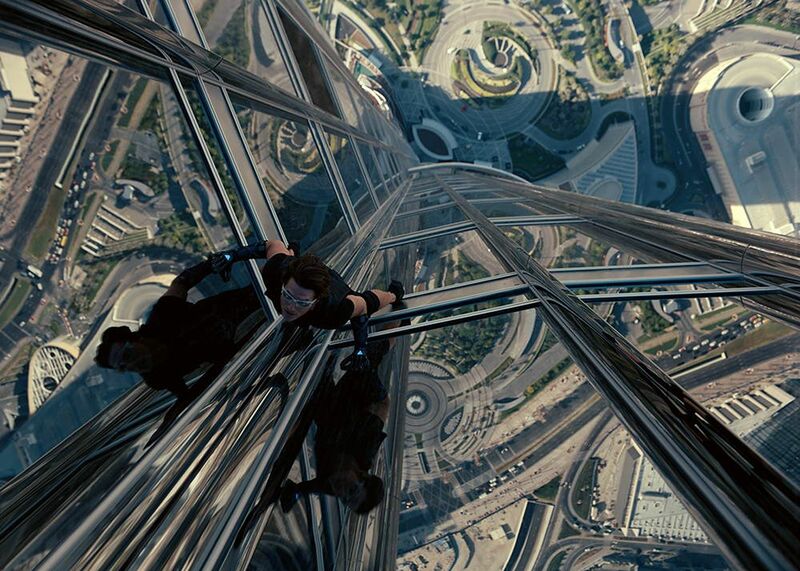 When Ethan Hunt is scaling the windows of Dubai's Burj Khalifa Tower, that's really Cruise up there. Acting as both general and soldier when he's on screen, Cruise is in his element here, but willing to step aside when it's necessary to further the story. When Ethan Hunt and fellow IMF agents Benji Dunn (Simon Pegg, Star Trek) and Jane Carter (Paula Patton, Deja Vu) are implicated in an attack on The Kremlin, the President initiates Ghost Protocol, basically disavowing the entire IMF corps. Agent Hunt and his team escape after a deadly attack and learn that the event in Moscow is a deadly prelude to a more sinister plan. Rather than learning how each piece of the puzzle works, which was the problem with MI: I and III, we are presented with goals/benchmarks that our players must complete in order to reach the next 'level.' Think part video game, part weekend garage project. This doesn't get in the way of the film's character development, nor does it interfere with the large action set pieces that make up some of the movie's best scenes. There are several side stories that I won't bore you with, but it's safe to say that many of our actors come with some sort of secret agent baggage when Cruise re-assembles them after The Kremlin. Even Cruise's marriage from MI: III is discussed, which helps to create a sense of continuity that was lacking in the other films. Dialogue is funny without being silly, and tense moments are not overly emotional. Although the action is totally unrealistic, perhaps that's what we should expect from our heroes. You are forced to suspend belief anyways with these large action pieces, so the toughness of our heroes is to be expected. I've gone on here without talking about Jeremy Renner (The Town, The Hurt Locker); his arrival as analyst William Brandt is just what Cruise and the franchise needed. Renner, the perfect rough-hewn protagonist, is exciting to watch and cut from the same fabric as Daniel Craig, Matt Damon, and Cruise himself. Brandt is one part straight-laced paper-pusher, another part mysterious. His past directly involves Hunt, but the movie doesn't tip that hand too early. Renner bears a lot of weight in this film, filling in nicely when Cruise isn't around. The long term plan is to make Renner the centerpiece of the MI films, which I personally support. Simon Pegg is good, as is Paula Patton - she's part of a good cat fight that I wish had continued a while longer. There's not much to say about the bad guy here, except to say that he's, well...not around that much. But this movie doesn't rely on a baddy to say baddy things too much - he's more like a mouse to Hunt's cat. I'd like to see Hollywood in general embrace bad guys over several films, giving audiences a chance to really 'hate' one (think Darth Vader) before taking him/her down. The lack of one here doesn't reduce the effectiveness of the film. Director Brad Bird (Ratatouille, The Incredibles) makes a seamless and elegant transition from the animated world to that of live action. Several of his sequences are sweeping, but he doesn't get lost in them. Bird is tightly focused in action scenes and allows the film to breathe when it needs. There are a couple of cameos in the film (and one that should have been there), and fans of the franchise will silently laugh at the way this film makes fun of itself at times; again, the comedy is welcomed because it doesn't bog down the 133-minute runtime, which is enthralling from the opening scene. We have seen great examples of Paramount’s home entertainment line this year, and MI:IV is no different. Simply put, this is the best transfer I have seen in 2012; it is in a word, stunning. The film is presented in MPEG-4 AVC, which delivers a picture that will look amazing on any HDTV. Colors are crisp and do not bleed into others, shadows and blacks in alleys mix just well enough to make you want to look over your shoulder. Sweat and blood stand out along with hair and skin tones. Stitching in suits and wrinkles in dresses are detailed as well, and exterior scenes (such as those in Dubai) are beautifully colored and clear. Again, it’s an excellent transfer. Again, Paramount’s acumen in transferring their films to home entertainment is apparent here. MI:IV is presented in DTS-HD Master Audio 7.1, which creates an immersive experience in nearly every scene. Explosions, gunfire, and hand-to-hand combat are loud but very clear. Each hit is as bone-jarring as the next. As Cruise arrives at a fashionable party, you can hear just-barely audible side conversations; as he climbs the Burj Khalifa Tower, you can hear the sound of flesh on glass. Low-end doesn’t get in the way of dialogue, which keeps one from having to play The Remote Game to hear conversations. Michael Giacchino’s (Alias) soundtrack is rousing in certain moments, but (like the IMF itself) operates best in the shadows. In tone and impact, this audio release is remarkable, and represents one of the best of 2012. Mission Accepted -- Suiting Up in Prague (17:58): Director Brad Bird, Tom Cruise, and J.J. Abrams discuss various aspects to the production side of the film. Mission Accepted - Heating Up in Dubai (17:36): The city of Dubai is featured here, along with its centerpiece, The Burj Khalifa. Vancouver Fisticuffs (12:01): Shooting in the city of Vancouver is front and center, along with other elements. The Russian Prison (11:49): A Czech prison is featured here. Shooting in IMAX (3:33): If you saw this film in IMAX, learn more about the process. Art Department (2:56): Prague is transformed into Russia during this featurette. A Roll of Film (2:33): If you love the technical back story of making a film, watch this one with Post-Production Coordinator Robby Stambler. Life Masks (1:40): Trust me, a stone mask of your face is out there somewhere. Stepping Into the Storm (2:02): The sand storm sequence is discussed. The Sandstorm (3:06): More information of how the sandstorm was shot. Dubai Car Crash (8:15): Another nice featurette about the car crash scene involving a couple of BMW’s. Lens on the Burj (0:57): Burj Khalifa is featured again. Props (3:07): I wish I had a house filled with movie props like these. Composer (10:42): Composer Michael Giacchino is featured. Deleted Scenes (15:02): Alternate Opening: Hendricks Practices His Speech, Mission on the Train, Confusion in the Van, Benji Almost Caught in the Kremlin, Hendricks and Leonid in the Hangar, Arrival at the Burj -- Original Version, Ethan and Jane in the Jet, and Wistrom and Chips. You can choose to hear Brad Bird’s commentary for each. Trailers (1080p): Theatrical Trailer 1 (2:24) and Theatrical Trailer 2 (2:30). There are several versions of the film available, but again I suggest the Best Buy Exclusive. It’s got an embossed slipcover and a 3-disc Combo Pack inside. People have slammed Tom Cruise over the years, and with good reason. It's time however to give the guy his credit and perhaps let him back into the party. 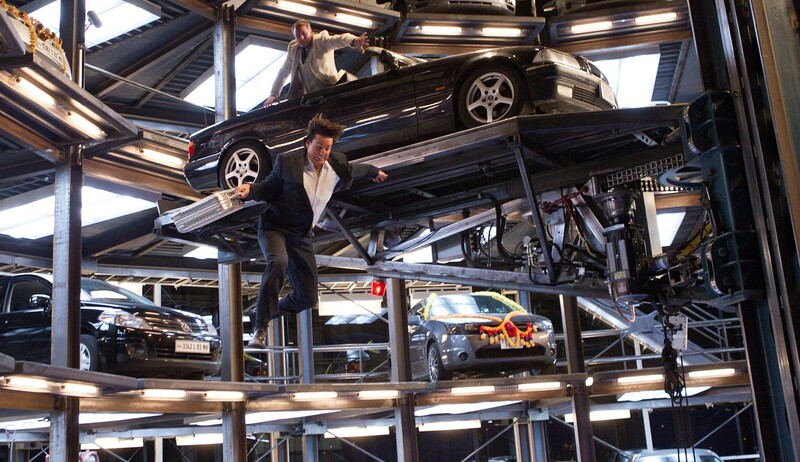 Cruise delivers a solid, comeback-film performance in Mission Impossible IV: Ghost Protocol, and the transfers are simply amazing. Add to that a nice set of supplements, and you have a release that's a first-day purchase to be sure. Highly recommended. Thanks for this nice review, and I am looking forward to the special features when I buy the Blu-ray. I saw “Ghost Protocol” recently with my Blockbuster @Home service and I like that I can preview movies before I decide to buy them. This is definitely a purchaser, and the 7.1 audio and pristine image quality was so amazing. Tom did a good job with being a commanding player, as usual. I really appreciate the unlimited Blu-ray with my Blockbuster @Home though, because I watch a lot more movies than I would otherwise. Perhaps they won’t wait so long to make the 5th installment, and I can see it in the theater.